For those who wish to further explore the thoughts and arguments in any part of the book Climate Justice. An Introduction (London/New York: Routledge, 2016), the following references may helpful. Arnold, Denis G., ed. (2011): The Ethics of Global Climate Change. Cambridge/New York: Cambridge University Press. Broome, John (2012): Climate Matters. New York: W. W. Norton & Company. Cripps, Elizabeth (2013): Climate Change and the Moral Agent: Individual Duties in an Interdependent World. Oxford/New York: Oxford University Press. Darwall, Stephen (1998): Philosophical Ethics. Dimensions of Philosophy. Boulder, CO: Westview Press. Gardiner, Stephen M. (2004): "Ethics and Global Climate Change", Ethics 114 (3): 555-600. - (2006): "A Perfect Moral Storm: Climate Change, Intergenerational Ethics and the Problem of Moral Corruption", Environmental Values 15 (3): 397-413. - (2010): "Ethics and climate change: an introduction", Wiley Interdisciplinary Reviews: Climate Change 1 (1): 54-66. - (2011): A Perfect Moral Storm: The Ethical Tragedy of Climate Change. Environmental Ethics and Science Policy Series. Oxford/New York: Oxford University Press. Gardiner, Stephen M. et al., ed. (2010): Climate Ethics: Essential Readings. Oxford/New York: Oxford University Press. Garvey, James (2008): The Ethics of Climate Change. Right and Wrong in a Warming World. London/New York: continuum. Page, Edward A. (2006): Climate Change, Justice and Future Generations. Cheltenham: Edward Elgar. Palmer, Clare (2011): "Does nature matter? The place of the nonhuman in the ethics of climate change". In: The Ethics of Global Climate Change. ed. by Denis G. Arnold. Cambridge/New York: Cambridge University Press: 272-291. Vanderheiden, Steve (2008): Atmospheric Justice. A Political Theory of Climate Justice. New York/Oxford: Oxford University Press. Betz, Gregor (2012): "The case for climate engineering research: an analysis of the ,arm the future' argument", Climatic Change 111 (2): 473-485. Gardiner, Stephen M. (2010): "Is ,Arming the Future' with Geoengineering Really the Lesser Evil? Some Doubts about the Ethics of Intentionally Manipulating the Climate System". In: Climate Ethics: Essential Readings. ed. by Stephen M. Gardiner et al. Oxford/New York: Oxford University Press: 284-312. Gosseries, Axel (2008): "On Future Generations' Future Rights", The Journal of Political Philosophy 11 (4): 446-474. Howarth, Richard B. (1992): "Intergenerational Justice and the Chain of Obligation", Environmental Values 1 (2): 133-140. Jamieson, Dale (1996): "Ethics and Intentional Climate Change", Climatic Change 33 (3): 323-336. - (2005): "Adaptation, Mitigation, and Justice". In: Perspectives on Climate Change: Science, Economics, Politics, Ethics. ed. by Walter Sinnott-Armstrong and Richard B. Howarth. Advances in the Economics of Environmental Resources, Vol. 5. Amsterdam: Elsevier: 217-248. Mulgan, Tim (2006): Future People: A Moderate Consequentialist Account of Our Obligations to Future Generations. Oxford: Oxford University Press. - (2007): "Fairness on the Day after Tomorrow: Justice, Reciprocity and Global Climate Change", Political Studies 55 (1): 225-242. Parfit, Derek (2010): "Energy Policy and the Further Future. The Identity Problem". In: Climate Ethics: Essential Readings. ed. by Stephen M. Gardiner et al. Oxford/New York: Oxford University Press: 112-121. Bell, Derek (2011): "Does anthropogenic climate change violate human rights? ", Critical Review of International Social and Political Philosophy 14 (2): 99-124. Caney, Simon (2010): "Climate Change, Human Rights and Moral Thresholds". In: Human Rights and Climate Change. ed. by Stephen Humphreys. Cambridge University Press: 69-90. Cowen, Tyler and Derek Parfit (1992): "Against the Social Discount Rate". In: Justice Between Age Groups and Generations. ed. by Peter Laslett and James Fishkin. New Haven: Yale University Press: 144-161. Gardiner, Stephen (2006): "A Core Precautionary Principle", Journal of Political Philosophy 14 (1): 33-60. Gosseries, Axel (2008): "Theories of intergenerational justice: a synopsis", S.A.P.I.EN.S 1.1: 61-71. Gosseries, Axel and Lukas H Meyer (2009): Intergenerational justice. Oxford: Oxford University Press. Manson, Neil A (2002): "Formulating the precautionary principle", Environmental Ethics 24 (3): 243-262. Meyer, Lukas and Dominic Roser (2009): "Enough for the Future". In: Intergenerational Justice. ed. by Axel Gosseries and Lukas H. Meyer. Oxford: Oxford University Press: 273-300. 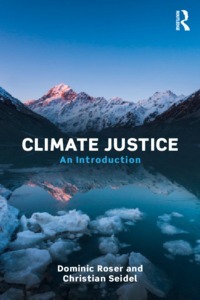 Page, Edward (2006): Climate change, justice and future generations. Cheltenham: Edward Elgar. Rendall, Matthew (2011): "Climate Change and the Threat of Disaster: The Moral Case for Taking Out Insurance at Our Grandchildren's Expense", Political Studies 59 (4): 884-899. Roeser, Sabine et al., ed. (2012): Handbook of Risk Theory. Dordrecht: Springer. Roser, Dominic (2009): "The discount rate: a small number with a big impact". In: Applied Ethics: Life, Environment and Society. ed. by Center for Applied Ethics and Philosophy. Sapporo: Hokkaido University: 12-27. Sunstein, Cass and David Weisbach (2009): "Climate Change and Discounting the Future: A Guide for the Perplexed", Yale Law and Policy Review 27: 433-457. Baer, Paul et al. (2010): "Greenhouse Development Rights: A Framework for Climate Protection That Is ,More Fair' Than Equal Per Capita Emissions Rights". In: Climate Ethics. Essential Readings. ed. by Stephen M. Gardiner et al. Oxford/New York: Oxford University Press: 215-230. Bell, Derek R. (2010): "Justice and the politics of climate change". In: Routledge Handbook of Climate Change and Society. ed. by Constance Lever-Tracy. London/New York: Routledge: 423-441. Caney, Simon (2005): "Cosmopolitan Justice, Responsibility, and Global Climate Change", Leiden Journal of International Law 18 (4): 747-775. - (2006): "Environmental Degradation, Reparations, and the Moral Significance of History", Journal of Social Philosophy 37 (3): 464-482. - (2009): "Justice and the distribution of greenhouse gas emissions", Journal of Global Ethics 5 (2): 125-146. - (2010): "Climate change and the duties of the advantaged", Critical Review of International Social and Political Philosophy 13 (1): 203-228. - (2011): "Climate change, energy rights, and equality". In: The Ethics of Global Climate Change. ed. by Denis G. Arnold. Cambridge/New York: Cambridge University Press: 77-103. Gosseries, Axel (2004): "Historical Emissions and Free-Riding", Ethical Perspectives 11 (1): 36-60. Grubb, Michael et al. (1992): "Sharing the Burden". In: Confronting Climate Change. Risks, Implications and Responses. ed. by Irving M. Mintzer. Cambridge/New York: Cambridge University Press: 305-322. Meyer, Lukas H. and Dominic Roser (2010): "Climate justice and historical emissions", Critical Review of International Social and Political Philosophy 13 (1): 229-253. Moellendorf, Darrel (2011): "Common atmospheric ownership and equal emissions entitlements". In: The Ethics of Global Climate Change. ed. by Denis G. Arnold. Cambridge/New York: Cambridge University Press: 104-123. Neumayer, Eric (2000): "In defence of historical accountability for greenhouse gas emissions", Ecological Economics 33 (2): 185-192. Page, Edward (2011): "Climatic Justice and the Fair Distribution of Atmospheric Burdens", The Monist 94 (3): 412-432. - (2012): "Give it up for climate change: a defence of the beneficiary pays principle", International Theory 4 (2): 300-330. Shue, Henry (1996): "Environmental Change and the Varieties of Justice". In: Earthly Goods. Environmental Change and Social Justice. ed. by Fen Osler Hampson and Judith Reppy. Ithaca: Cornell University Press: 9-29. - (2010): "Global Environment and International Inequality". In: Climate Ethics. Essential Readings. ed. by Stephen M. Gardiner et al. Oxford/New York: Oxford University Press: 101-111. Singer, Peter (2002): One World. The Ethics of Globalization. New Haven/London: Yale University Press. Weijers, Dan, David Eng and Ramon Das (2010): "Sharing the responsibility of dealing with climate change: Interpreting the principle of common but differentiated responsibilities". In: Public Policy. Why ethics matters. ed. by Jonathan Boston, Andrew Bradstock and David Eng. Canberra: ANU E Press: 141-158. Bell, Derek (2002): "How can political liberals be environmentalists? ", Political studies 50 (4): 703-724. - (2011): "Does anthropogenic climate change violate human rights? ", Critical Review of International Social and Political Philosophy 14 (2): 99-124. Cafaro, Philip (2011): "Beyond business as usual: alternative wedges to avoid catastrophic climate change and create sustainable societies". In: The Ethics of Global Climate Change. ed. by Denis G. Arnold. Cambridge: Cambridge University Press: 192-215. - (2012): "Climate ethics and population policy", WIREs Climate Change 3 (1): 45-61. Caney, Simon and Cameron Hepburn (2011): "Carbon Trading: Unethical, Unjust and Ineffective? ", Royal Institute of Philosophy Supplements 69: 201-234. Cripps, Elizabeth (2011): "Climate change, collective harm and legitimate coercion", Critical Review of International Social and Political Philosophy 14 (2): 171-193. - (2013): Climate Change and the Moral Agent: Individual Duties in an Interdependent World. Oxford: Oxford University Press. Gardiner, Stephen M.(2011a): "Is no one responsible for global environmental tragedy? Climate change as a challenge to our ethical concepts". In: The Ethics of Global Climate Change. ed. by Denis G. Arnold. Cambridge: Cambridge University Press: 38-59. Gardiner, Stephen M. (2011b): A perfect moral storm: The ethical tragedy of climate change. New York: Oxford University Press. Gosseries, Axel und Iñigo González, eds. (2017): Institutions For Future Generations. Oxford: Oxford University Press. Held, David and Angus Fane-Hervey (2011): "Democracy, Climate Change and Global Governance: Democratic Agency and the Policy Menu Ahead". In: The Governance of Climate Change: Science, Economics, Politics and Ethics. ed. by David Held, Angus Fane-Hervey and Marika Theros. Cambridge: 89-110. Heyward, Clare (2012): "A Growing Problem? Dealing with Population Increases in Climate Justice", Ethical Perspectives 19 (4): 703-732. Hiller, Avram (2011): "Climate Change and Individual Responsibility", The Monist 94 (3): 349-368. Hohl, Sabine and Dominic Roser (2011): "Stepping in for the Polluters? Climate Justice under Partial Compliance", Analyse und Kritik 33: 477-500. Mulgan, Tim (2011): Part IV from Ethics for a Broken World. Durham: Acumen. Murphy, Liam B (2000): Moral demands in nonideal theory. New York: Oxford University Press. Nolt, John (2011): "How Harmful Are the Average American's Greenhouse Gas Emissions?" Ethics, Policy & Environment 14 (1): 3-10. Page, Edward A (2011a): "Cashing in on climate change: political theory and global emissions trading", Critical Review of International Social and Political Philosophy 14 (2): 259-279. Page, Edward A. (2011b): "Cosmopolitanism, climate change, and greenhouse emissions trading", International Theory 3 (1): 37-69. Saul, Ulrike and Christian Seidel (2011): "Does leadership promote cooperation in climate change mitigation policy? ", Climate Policy 11 (2): 901-921. Schramme, Thomas (2011): "When consumers make environmentally unfriendly choices", Environmental Politics 20 (3): 340-355. Sinnott-Armstrong, Walter (2005): "It's not my fault: global warming and individual moral obligations". In: Perspectives on climate change. Vol. 4. ed. by Walter Sinnott-Armstrong and Richard B.Howarth. Amsterdam: Elsevier: 285-307. Spash, Clive L (2010): "The brave new world of carbon trading", New Political Economy 15 (2): 169-195. Stevenson, Hayley and John Dryzek (2014): Democratizing Global Climate Governance. Cambridge: Cambridge University Press. Tomlinson, Luke (2015): Procedural Justice in the United Nations Framework Convention on Climate Change: Negotiating Fairness. Berlin: Springer.